There are many books about writing and style that more or less focus on grammatical constructions. There are also some very interesting books on education and the curriculum. These are the two types of books that are reviewed here. Fish, Stanley. How to Write a Sentence. Graff and Birkenstein. "They Say/I Say"
Lanham, Richard A. Revising Prose. 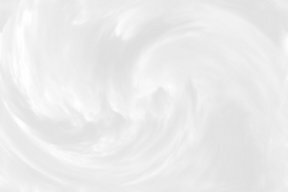 Lanham, Richard A. Style: an Anti-Textbook. Tufte, Virginia. Artful Sentences: Syntax as Style. Williams, Joseph M. Style: Ten Lessons in Clarity ? Grace. Bortins, Leigh A., The Core: Teaching Your Child the Foundations of Classical Education. Brill, Steven. 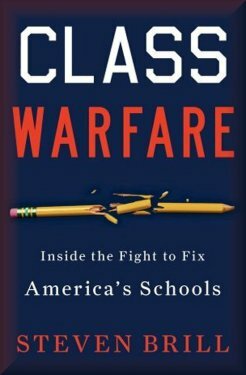 Class Warfare: Inside the Fight to Fix America's Schools. Perry, William G., Jr. "Examsmanship and the Liberal Arts: A Study in Educational Epistemology"
Riesman, David. with Nathan Glazer and Reuel Denney. The Lonely Crowd. Although the books in this section can be read by anyone, they are probably best appreciated by people who already have a fairly good understanding of grammatical terms. For example, many of these books discuss passive voice, but they generally assume that their readers already know what passive voice is. For readers who do not, these books can be confusing. Note that grammar textbooks per se are not reviewed. Fish, Stanley. How to Write a Sentence. N.Y.: HarperCollins, 2011. Let’s say I’m teaching the neither/nor form. I begin by producing a simple neither/nor sentence. “Neither his age nor his disability prevented him from competing.” I then ask my students to write their own sentences on that model. Most of them are able to do it, and they produce sentences with 20 different contents, but only one form. The next step is for the students to figure out what that form is. Just how does a neither/nor sentence organize items and actions in the world? He continues for several paragraphs explaining the value of this exercise, but he misses some important questions. First, is he really suggesting that graduate students cannot already use "neither . . . nor . . . . "? Second, is he suggesting that such exercises on "neither . . . nor . . . . " will help his graduate students whose sentences fall apart after six words? And third, does he realize that S-R conditioning theory suggests that the effects of such exercises (which do not require any understanding of the grammatical forms involved) will quickly wear away? In the third article, he admits that he is still attempting to "work out" a way to teach grammar. He proposes supplementing his own sentence-model approach with "a standard grammar text filled with the usual terminology, a terminology that will not seem impenetrable and hostile to students who have been learning how language works at a level these texts assume but do not explicate." He offers two of his favorites. The first is Geraldine Woods’ English Grammar for Dummies. He likes this book "because its examples are so fanciful ('Lochness loves my singing') that there is no danger of becoming interested in their content." To me this sounds like "I'm going to buy this car because I love the stripes on its sides." His second favorite is Martha Kolln’s Rhetorical Grammar: Grammatical Choice, Rhetorical Effects. He likes this book "because of Kolln’s emphasis on how grammatical choices fulfill and/or disappoint reader expectations." Kolln's book, however, like almost all textbooks, does not even try to teach students how to analyze the structure of their own sentences. Put differently, it shows students magic tricks without teaching the students the basic mechanics that underlie those tricks. Fish ends this article by recommending an article by Lynn Sams (“How to Teach Grammar, Analytical Thinking and Writing; A Method that Works,” English Journal, January, 2003. Sams' article is interesting, but incomplete. The examples in her article are almost all extremely simple sentences, but she does propose a three-year sequence for teaching grammatical terms -- parts of speech in sixth grade; seventh grade would move from "simple two-word sentences through compound-complex sentences"; and in eighth grade students would apparently add "infinitive, noun, gerund, participial, appositive, and absolute phrases, and more practice with compound-complex sentences." Users of KISS will probably note that the sequence she proposes is similar to the KISS sequence -- but compressed into three years. If Sams would give more details about how this sequence would work, I'd probably support her -- I've always said that KISS is not the only possible approach. Given what she wrote, however, it appears that she may have in mind teaching the students the constructions, but not necessarily enabling students to identify those constructions in what they themselves write. As I looked over my notes on Bizzell's book, I found that I wrote, "She is an unwilling agnostic who is more interested in teaching 'social justice' than she is in teaching students how to write better." Fish's part in Bizzell's beliefs is, as noted above, difficult to determine, but she regularly acknowledges his influence in shaping her views. (By their fruits you will know them?) In addition, Fish acknowledges having taught many graduate students in composition, and Fish himself is highly political. Is he attempting to atone for previous sins? That is true. But why haven't educators ever asked if that terminology could be better explained, and could be taught (sequentially across several years of schooling) such that students actually could understand and use it? This idea certainly never floats into Fish's mind. Instead, he claims that students should learn some grammatical terms, but he is not clear about which, why, and when. Ironically, he himself does not appear to have a good command of such terms. He refers, for example, to "A man in possession of a good fortune" and "in want of a wife" as "two clauses." Grammarians disagree about definitions, but I doubt that any grammarian would agree that these are clauses. The book is also weird in that it is almost entirely about sentences from stories and novels. Strunk and White, Joseph Williams, Richard Lanham, and most of the others who write books about sentence structure and style primarily focus on expository prose -- the kind of writing that students do in high school or college courses, including those graduate courses (and students) about which (and whom) Fish complained. Given Fish's complaint, I assumed that this is what he would be addressing. In Fish, however, you will find delicately analyzed sentences by Jane Austen, Henry James, Melville, Milton, and the literary list goes on and on. The analysis, moreover, includes very slight (sometimes no) discussion of sentence structure. Most of it is about vocabulary, and about how that sentence fits into the work as a whole. Thus there are chapters on "First Sentences" and "Last Sentences" -- in literary works. Fish enjoys showing off his erudition as he explains the allusions in these sentences and how they connect to the work as a whole, but he explains very little about sentence structure. His definitions, moreover, are no better (and probably worse) than those in most grammar textbooks. He tries to explain -- "the main verb of the sentence is whatever action is being performed, and in this case it is the action 'prevents'." (20) His definition, like those in many grammar textbooks, is limited to the example that he is discussing. Many sentences have main verbs that do not express an action. Clearly Fish's definition is incomplete. The reward for the effacing of ourselves before the altar of sentences will be that "incidentally" (what a great word!)  -- without looking for it -- we will possess a better self than the self we would have possessed had we not put ourselves in service. Sentences can save us. Who could ask for anything more? The "altar of sentences"? "Sentences can save us"? Save us from what? There is the current of a lost soul, not only here, but also in many of Fish's discussions of literary sentences. How to Write a Sentence is a book written by an "amateur" -- in both the negative and positive senses of the term. When it comes to teaching sentence structure, Fish is clearly an amateur in the negative sense -- he is tinkering around with something he (admittedly) does not understand. Unfortunately, his reputation will draw many people to this book, thinking that they might learn something about teaching sentence structure. They will not find much that is useful. In the positive sense, Fish is clearly a lover of sentences. For people who share his love (and for students of creative writing), this is an excellent book. They Say is not primarily a book about grammar, but it is a great book for those of us who teach writing, do not have the time to teach grammar, but know that our students need instruction in grammar. The primary idea behind the book is that any writing is part of a conversation (thus the title). To teach students how to write in a way that participates in such conversations, the authors present students with a number of "moves" and examples of "templates" that are used to make the moves. In the chapter on "The Art of Summarizing," for example, they give templates such as "They celebrate the fact that ___________________." They also give a page and a half list of what they call "signal verbs" -- argue, report, suggest, agree, praise, qualify, refute, etc. (39-40). Similarly, in a chapter on "Connecting the Parts," they give a list of adverbs and adverbial phrases (not so named) that function as transitions -- also, in fact, for example, by extension, to sum up. (109-110). In an ideal educational world, high school students would be able to see how all the words in any sentence function together to make meaning. But we do not live in such a world. I'd suggest that even students who do know the grammatical terms would profit from this book, but the book is an excellent presentation of important grammatical functions even though it does not often use grammatical terms. This is an interesting and helpful book. Lanham concentrates on clarity, on strong, active voice verbs, on the elimination of strings of embedded prepositional phrases (especially "of" phrases), and on the rhythm of sentences. He also devotes a chapter each to "Business Prose," "Professional Prose," and "Electronic Prose." This "Anti-Textbook" touches on some of the grammatical questions he discussed in Revising Prose, but it is more about style in general -- chapters are devoted to "The Uses of Obscurity," "The Opaque Style," "The Delights of Jargon," and "Poetic Prose." Lanham does make some interesting points, and he does an excellent job of bashing the typical writing textbooks (which is why I'm including this review). One does not really need a background in grammatical terminology in order to enjoy (or detest) this book. Unfortunately, I can't remember who suggested this book to me, but I do thank whoever it was. If your students are having problems with the parts of speech, this is a cute 120-page narrative that may help them. The parts of speech (Dr. Verb, etc.) can't agree about which words belong to whom, so they present their cases to Judge Grammar. In so doing, each part explains how its words function, thus providing another perspective on the functions of each part of speech. Dr. Verb even explains "three tenses, number, and person." Most of the chapters include a short exercise, most of which fit nicely into the KISS framework. (I plan on using a few of them in the KISS Workbooks.) Mr. Conjunction is also explained, but the book does not distinguish coordinating from subordinating conjunctions. (In KISS, subordinating conjunctions are introduced in Level 3, so that is not a problem.) The idea that the "part" to which a word "belongs" in dealt with nicely in Chapter VI ("Mr. Adjective Tried for Stealing"). The book also does a beautiful job with words such as "his," "her" and "its." Some grammar books categorize these words as adjectives; others claim that they are pronouns; and I have seen one book that notes the disagreement. In Chapter VII of this book ("The Quarrel between Mr. Adjective and Mr. Pronoun and Little Interjection") the parties come to a nicely explained compromise. They agree that which category a word belongs to depends upon how it is used (its function) in a specific sentence. From a larger perspective, the book presents "article" ("a," "an," and "the") as a separate part of speech, resulting in nine parts rather than the traditional eight. (In KISS, articles are simply considered adjectives.) This could be used as a starting point for a discussion of the very categorization of "parts of speech." Different grammars, especially modern linguistic ones, categorize words differently, thereby having different numbers of basic "parts." Artful Sentences is an excellent supplement to the KISS Approach to teaching grammar. Some of the grammatical terms that Tufte uses differ from those in KISS, but students of KISS will probably appreciate the book more because they will come to it with the ability to identify the constructions that Tufte discusses. Her focus is entirely on style. Her explanation and examples of passive verbs (the last half of Chapter Three) is the best that I have ever seen. The whole book is well worth reading, but I particularly like the chapters on "Parallelism" and "Syntactic Symbolism." Williams, Joseph M. Style: Ten Lessons in Clarity ? Grace. Glenview: Scott, Foresman, 1981. In other words, this is not a book for high school students, or even for most college undergraduates. Relatively few college students write the type of prose that Williams addresses in the book. Put still differently, the disease for which Williams offers a remedy is usually developed in the last two years of college as students attempt to mimic the flatulent prose they are forced to read. High school students and college Freshmen and Sophomores rarely write this type of prose. 1. Find phrases that you can replace with a single word. 2. Cross out whatever interrupts subject-verb and move it before the subject. 3. Circle verbs. Revise so that the crucial actions are in verbs. This is excellent advice, but some people are confused by the word "phrase." Items 2 and 3, moreover, assume that his readers can in fact identify subjects and verbs in their own writing. This contradiction between what Williams says about not learning to identify the parts of speech and his then telling his readers to use their knowledge of them is somewhat understandable. He is not trying to write a grammar textbook, and he has in mind that traditional instruction in grammar which KISS Grammar is directly designed to improve. But he still leaves his readers with a major problem. Those who have mastered clauses in the KISS Approach will have not have that problem. For most students, I would recommend Lanham's Revising Prose rather than this book. Adler, Mortimer J. ? Charles Van Doren. How to Read a Book: The Classic Guide to Intelligent Reading. Revised and Updated Edition. N.Y.: Simon ? Schuster, 1972. How to Read a Book deserves its excellent reputation, primarily because of the distinctions and suggestions it makes and an underlying theme. Adler and Van Doren explain that different types of books should be read differently -- and some books should be read more than once. Part Three, Approaches to Different Kinds of Reading Matter," goes into this in more detail. Like the rest of the book, it illustrates the important underlying theme: good readers read actively -- they constantly ask questions about the text as a whole, and about many, if not most of the details. The authors distinguish four "levels" of reading -- 1.) Elementary Reading, 2.) Inspectional Reading, 3.) Analytical Reading, and 4.) Syntopical Reading. These levels create a hierarchy that reflects the different types of questions that can be posed by a reader at each level. In addition to what one might expect, the discussion of "Elementary Reading" briefly surveys historical approaches to teaching reading. The problem with this, of course, is that "second" time -- or third, or fourth, etc. The authors were, in essence, professional readers. (They did not, for example, have to teach and grade the papers for five sections of composition each semester.) Many of us may have the desire, but not the time, to reread that often. Still, the suggestion is a good one. I have often enjoyed and profited from second and third readings of books. The third level, "Analytical Reading," explains various "frames of reference" (See Perry.) for coming to terms with a single text, including "The Importance of Classifying Books," "Determining the Author's Message," and "Criticizing a Book Fairly." The fourth level shifts to a different set of "frames." These primarily involve reading a book in the context of other books on the same topic, and in terms of other books that share a similar frame of reference. Leigh Bortins is the founder and CEO of Classical Conversations, Inc., a support group for Christian homeschoolers. I still have my doubts about home schooling in general, but Bortins' The Core illustrates some tremendous advantages that homeschoolers may have. The most important of these is an integrated grade-level to grade-level curriculum in which one year builds on what was previously learned. As I have mentioned elsewhere, at the first conference of what is now the NCTE Assembly for the Teaching of English Grammar, presentations on how to teach the parts of speech were given by primary, middle, and high school teachers, and by college instructors. In other words, in our current public (and probably many private) school systems, instruction begins at the same beginning, year after year, and it apparently goes nowhere. As a whole, this book is well worth reading, and not only for homeschoolers, but also for people interested in improving public education. Four things in Bortins' philosophy of education particularly impressed me. First is her emphasis on memorization and over-learning. Throughout the book she stresses that basic concepts need to be practiced, practiced, and practiced until they become automatic. This is an underlying principle of KISS Grammar. But Bortins extends this by using "grammar" in two different meanings -- the grammar of the English language, and the grammar (basic concepts) of any field of study -- history, math, science, etc. Third, Bortins stresses regular, frequent, even daily writing. I love the way she focusses on correctness of spelling, correct grammar, and basic writing formats. She suggests that early in their writing students should simply copy samples of good writing, which is not a bad idea. In their early writing, she correctly downplays "originality." She is probably reacting to a twenty-plus year trend in public education that stresses "originality" even in the writing of very young students. But as Bortins notes, originality will come of itself later -- once students' minds are stocked with facts (and I would add "frames of reference" -- See below.) In essence, she is agreeing with Gerald Graff and Cathy Birkenstein in their They Say / I Say. Fourth is her regular reminders to parents that they should learn with their children. Here I agree and disagree. New users of KISS Grammar often tell me that they want to "brush up on grammar" before they begin teaching their children. My general response to this is that they should jump in at KISS Level 1.1 and learn with their children. I do, however, suggest that they should first at least browse the How to Use KISS Grammar, the Background Essays, and the KISS Psycholinguistic Model. All three of these provide context, direction, and a theoretical background for teaching grammar. They provide what William Perry, in his humorous, somewhat difficult, but fundamentally important essay, "Examsmanship and the Liberal Arts: A Study in Educational Epistemology" calls "frames of reference." In essence, Perry argues that an educated mind is not just a storehouse for facts. He labels facts per se as "cow" -- "(pure): data, however relevant, without relevancies." For Perry, an educated mind knows how to "bull" (in a positive sense of that word). He defines the noun "bull" as "(pure): relevancies, however relevant, without data." Later he defines it as a verb -- "To discourse upon the contexts, frames of reference and points of observation which would determine the origin, nature, and meaning of data if one had any." Perry is surely correct that understanding "contexts, frames of reference and points of observation" is crucial. These, however, cannot be learned at the same time that the child is learning them. Indeed, they should determine what the teacher plans on teaching and why. Perhaps because she is reacting to the almost total lack of requirements for memorizing basic facts and concepts, Bortins appears to stress what Perry calls "cow," and I never got the sense that she appreciates Perry's "bull." I may be wrong. Perry, I should note, states that the best thinking is a "marriage" of cow and bull" -- both are necessary. As users of KISS Grammar might expect, the only other serious question I have about Bortins' text is her approach to teaching grammar. She is infatuated by Warriner's English Grammar and Composition (32). But Warriner's is a very simplistic text. Like most textbooks, it teaches the "parts," but really does not address how the parts fit together. Bortins admits, however, that she started teaching with a woeful lack of knowledge about grammar. She loves parsing sentences, but she is not completely clear about how she does it. Thus she states, "parsing just means to reduce a whole to its parts and identify them" (58). She gives a few examples, but they are all very simplistic. It would be very interesting to see how she has students parse longer, more complicated sentences. Her discussion of the "Structure of English" (118-124) is likewise simplistic and at times prescriptively wrong. Thus she claims that "All compound sentences have commas before conjunctions. Jack and Jill are nice, but I am nicer." (124) Anyone working at KISS Level 3 (clauses) should be looking at sentences from randomly selected real texts. They will see that many good writers often use a comma in this situation, but in many cases they do not. By what authority does Bortins tell students that they have to? Obviously, I have qualms about Bortins' approach to the grammar of the English language, but then I am not recommending her book as a grammar textbook. The book has many very important things to say about what education as a whole should look like. Brill, Steven. Class Warfare: Inside the Fight to Fix America's Schools. New York: Simon and Schuster Paperbacks, 2011. I bought this book to get free shipping when I purchased Finnish Lessons. It was a good purchase. Brill explores the political battles that plague our educational system. For me, it was a totally new, and very interesting perspective. He also makes a case for public charter schools. (I didn't know that such schools exist.) I recommend the book to everyone interested in the reform battle, but the book raises more questions than it answers. As Finnish Lessons argues, good teachers are very important, but Brill under-defines and over-rates the teachers' roles in our educational problems. Most of the teachers he discusses are K-5, and I doubt that I would want to work for any of them. Read the book for yourself, but what I saw was some every enthusiastic, dedicated, basically untrained, "lead" teachers who feel as if they can tell all the other teachers how to teach. I'm sure that the attitude of the public charter school teachers adds to the success of their students, especially the emphasis that every child is capable of learning, but Brill doesn't appear to be aware of the problems faced by many public school teachers. He does strongly undercut the opposition's argument that charters cull the "cream of the crop." Students get into public charter school by lottery. Although Brill acknowledges the fact that these students' parents are concerned about their children's education (whereas not all parents are), he doesn't seem to grasp the implications. Students in public charters are well-behaved and do their homework. My question is, what happens if they misbehave and/or don't do the homework? My guess is that they do not stay in the charter school. Brill doesn't discuss this. The biggest problem in our public schools is that students often misbehave and many rarely do homework. And they get passed on from one grade to the next. Teachers are not to blame for this. I've heard many a story from (or about) teachers who believed a student should fail and not be passed on to the next grade. But the teachers are usually over-ruled. The students, of course, realize this--and the next year they misbehave more and do even less, in or out of class. This aspect of the "system" raises major problems for both the teachers and the students. A seventh grade teacher, for example, may have to teach students who are reading anywhere from the third-grade level to the eleventh. The students who are reading below grade level either don't care or are totally lost. The students who are well above grade level are bored. You try teaching in these conditions. Gardner, Howard. The Unschooled Mind: How Children Think and How Schools Should Teach. Tenth-Anniversary Edition. New York: Basic Books, 2004. Gardner is most famous for his 1983 Frames of Mind: The Theory of Multiple Intelligences. In it he argues that there are different types of intelligence, for example, the mathematical, musical, and muscular. That book is important, but I would suggest that The Unschooled Mind is more important. Here, he shifts his focus from the differences in intelligence, to the differences in academic disciplines. As he says, "Stated simply, I believe that the primary intellectual mission of pre-collegiate education ought to be to inculcate in students the capacities to think in the ways that characterize the major scholarly disciplines." (xiii) He explains this beautifully in the next few pages, but what he means, for example, is that scientists think differently than historians--they ask different questions and require different kinds of proof. Experiments, for example, can prove or disprove scientific studies, but a historian cannot conduct experiments. I cannot do his explanation justice, but he also claims that it takes several years to become proficient in a discipline--to think like a scientist (of a specific kind) or like a historian, etc. An interesting point that he makes is that the "cross-disciplinary" courses in our high schools are really not disciplinary at all. He calls them "thematic," because the students (and the teachers?) do not have the training to think as a historian, biologist, or whatever other disciplines are involved. In essence, the courses become fact centered. Gardner is clearly opposed to the testing mania--the tests cannot evaluate understanding, and Gardner argues that how to understand is what we should be teaching. The third part of the book is "Toward Education for Understanding." The first part of the book, I should note, is "The 'Natural' Learner." In it, Gardner explores how we conceptualize the world for ourselves before we enter formal schooling. We learn a lot--in a lot of different ways. How this learning confronts school learning is another important theme throughout the book. I have had this book listed on this page (with the picture) for over a year--with a small "Forthcoming" instead of a review. As I write this now, I understand why I could not write the review then. The book is too good and too systematic to be summarized in a review. Because my students find this essay difficult to understand, I have written a somewhat lengthy explication. Click here to get it. Riesman, David. with Nathan Glazer and Reuel Denney. The Lonely Crowd. Abridged edition with a 1969 preface. New Haven: Yale University Press, 1961. 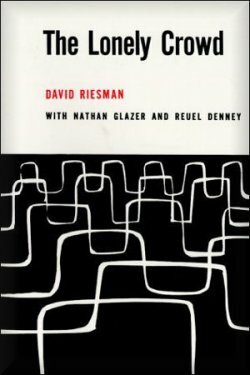 This may seem like an odd addition to a collection of book reviews on education, but Riesman and his colleagues present a huge historical perspective that sheds light on our current problems with discipline and standards. It requires a longer review, so if you are interested, click here. Sahlberg, Pasi. Finnish Lessons. N.Y.: Teachers College, Columbia University, 2011. Several years ago I happened to catch a T.V. documentary comparing education in the U.S. with that in Korea and Finland, both of which are acknowledged world leaders in education. 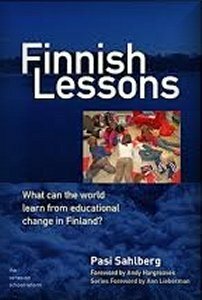 What caught my attention were the first words out of the mouth of a Finnish teacher--"We teach our students to be Finnish citizens." That is worlds away from the U.S. focus on going to school to get a job, and I still believe that the "job" focus is the major problem in U.S. education. Many of my students tell me that learning to write (or read), learning about history, government, and social issues are all not important to their reasons for going to college. Thus they are disengaged--Sahlberg mentions "Lack of engagement [as] the main reason for the challenges that teachers face in schools and classrooms today" (142-3). It's the truth. One cannot teach people who do not care to be taught, and "motivating" them with songs, dances, and undeserved praise not only does not work--it devalues education. For education to work well, society as a whole has to value it. Years later, having read an article about Sahlberg's book, I put it on my reading list. He makes good arguments. The most interesting to me is that schools cannot effectively be changed from the top down. The obsession with standards and testing, he rightly notes, is harmful. He explains that teachers in Finland are better trained and more respected. This struck me. My perception is that in the U.S. parents generally respect the teachers in our schools, but within the profession, teachers are not respected--even by those at the "top" of our educational hierarchies. Other things of interest are that education in Finland is basically free--straight through college. (But one needs to pass an exam to get into college.) Their view, and I agree with it, is that free education provides "social capital." In other words, a poor child who cannot get a good education will not be able to contribute the new inventions, ideas, or social engagement that the freely educated poor child can. Objections have been made to what Sahlberg calls "the Finnish way"--the main one is that Finland is small and basically homogeneous. He addresses them fairly well, but I have to question his explanations for Finland's success. Sahlberg regularly emphasizes the importance of the Finnish "welfare state." (For many in the U.S., the very idea of a "welfare" state is obnoxious.) Sahlberg never explains how Finland became a welfare state, but I would suggest that it did so because the country is historically Lutheran. (Sahlberg never mentions religion.) According to Wikipedia, in 2013, 75% of Finns were Lutheran; in 2000, 85%; and in 1900, 98%. In The Cultural Significance of the Reformation (N.Y.: Living Age Books, 1959), Karl Holl traces the "first seed for the development of the welfare state" to Martin Luther. It appears from Holl that Luther was strongly anti-capitalistic (89). According to Holl, Luther felt that primary duties of the Church should be to educate people to read (so they could read the Bible), and to take care of the poor--including the lower middle class that exists on the edge of poverty. "Luther conceived this obligation on a magnanimous scale." (91-2) Holl quotes from Luther's "Sermon on St. Stephen's Day" (1523): "But we do not have the men for it; therefore I do not dare begin until the Lord God makes some Christians." (93, 185) As a result, he assigned these two obligations to the state--the "first seed" of the welfare state. I may, of course, be asking for too much, but the book is rather expensive as I write this (Amazon $32.26; Kindle $19.22). And, in dealing with such an extremely complex topic, one can only cover tips of icebergs (as did my comments). Still, anyone who is really involved in improving education in the U.S. should probably read this book.